Organisers were blessed with strong southerly winds on race day, which whipped up plenty of bumps along this famous local run and made for some very fast times. Jake and Nottage flew out of the blocks and never looked back, trading the lead before Jake pulled clear in the second half to set an amazing average pace of 13.75km/h (8.54mph). It was a return to form for Jakey boy, who’s had a bit of a rollercoaster year results wise. Though in fairness to Nottage and Boothy, they were both paddling 12’6 boards whereas everyone else was on a 14 footer. Boothy did that because he has to compete in Fiji next month on a 12’6, so he wants to get accustomed to it. Nottage did it because… well, he’s Nottage. Wedging himself in between the international superstars was local dark horse Ben Tardrew, who is originally from W.A. but now calls Currumbin home. Benny is one of the most under rated downwind paddlers in Oz (as is his brother Marcus), while he’s now got a new job as the board designer for Currumbin-based specialty brand ONE SUP. With her main rival Angie Jackson sitting this one out to help organise, Karla was in total control of the women’s race, coming home about 8 minutes clear of runner-up Alison Fullagar, with Kate Baker just a couple of seconds behind in third. Karla will be in action again in a few weeks, with the former Queen of surf life saving set to compete for Team Australia at the ISA Worlds in Fiji. It’s not every week you can get several of the world’s top ranked paddlers, including the current world number two, competing at a local club race. But that’s the beauty of living here on the Gold Coast: it’s an absolute paddling mecca, with many of the world’s best paddlers calling Currumbin home. There was also an experimental new style of starting the race, which added an interesting little twist to proceedings. Instead of competitors sitting in a straight line on their boards (it’s impossible to get everyone lined up evenly in a bumpy ocean), there was a 30 minute countdown timer announced at the briefing, which everyone set their watches to. Five minute penalties were on offer if anyone crept over the line (which was between two jet skis) before the start, which kept everyone back, but also allowed the serious contenders to hit the line with speed if they timed it correctly (basically the same sort of deal you see in yacht racing). It was another little addition from race director Paul “Super Lap” Jackson, who’s always thinking of ways to push racing forward. It was also good to see about 8 or 9 unlimited boards on the start line, with the 17 footers from brands such as NSP and SIC starting to gain some traction here in Australia. We’ll likely see even more at the big ocean races in Western Australia in a month’s time — The Doctor and King of the Cut — while other brands such as Deep, ECS and ONE have begun designing their own unlimiteds as well. Thanks to the organisers for putting on a great race and giving more paddlers the opportunity to experience the excitement of ocean racing. 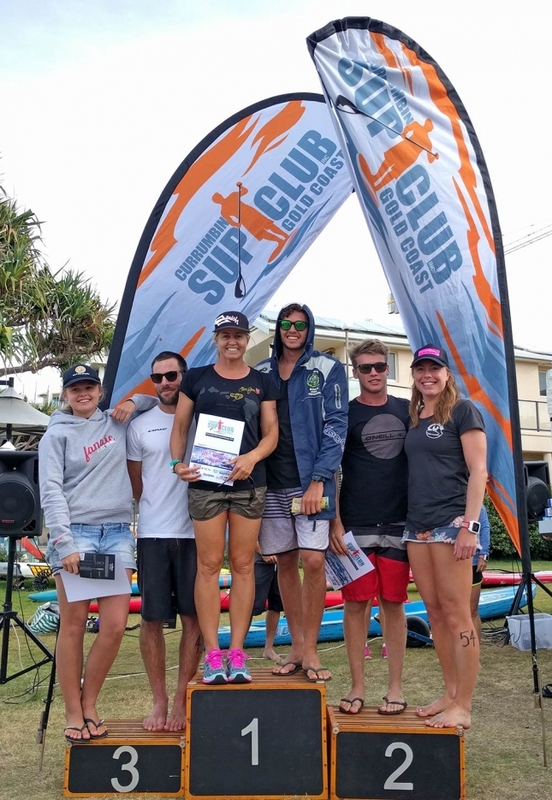 It was also great to see paddlers coming from all over South East Queensland, with the three other local clubs, SUPSA, BrisSUP and Sunshine Coast SUP all sending numbers to the event. Anyway here are the top 10 results from Currumbin. Full times available over on Webscorer.